Take a look at the packaging on a container of milk and you’re likely to see bucolic idylls of red barns, green pastures, and happy, well-treated cows. In truth, the distance from a living cow to a glass of milk is vast, and nearly impossible to grasp in a way that resonates with an average person ticking items off a grocery list. In contrast to the widely known truths of commercial meat manufacture, the dairy industry enjoys a relatively benign reputation, with most consumers unaware of this kitchen staple’s backstory. 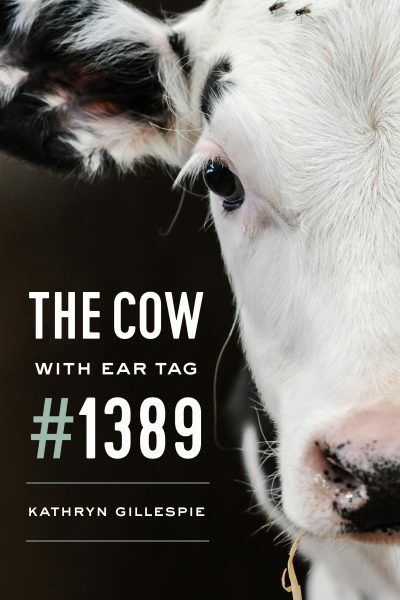 The Cow with Ear Tag #1389 explores how the seemingly nonthreatening practice of raising animals for milk is just one link in a chain that affects livestock across the agricultural spectrum. Gillespie takes readers to farms, auction yards, slaughterhouses, and even rendering plants to show how living cows are transformed into food. The result is an empathetic look at cows and our relationship with them, one that makes both their lives and their suffering real—in particular, the fleeting encounter with the cow of the title, just one animal whose story galvanized Gillespie to write this book. The myriad ways that the commercial meat industry causes harm are at the forefront of numerous discussions today. The Cow with Ear Tag #1389 adds a crucial piece to these conversations by asking us to consider the individual animals whose lives we may take for granted. Order The Cow with Ear Tag #1389 via University of Chicago Press or Amazon. Special thanks to Jo-Anne McArthur for her generosity in the use of the image for the cover. Kathryn Gillespie, PhD is a writer, feminist geographer, and critical animal studies scholar. Her research and teaching interests focus on: feminist theory and methods; food and agriculture; political economy; critical animal studies; critical race theory; postcolonial studies; incarceration/prison studies; gender and sexuality; human-environment relations. She is the author of The Cow with Ear Tag #1389 [University of Chicago Press, 2018]. She has also published in numerous scholarly journals and has co-edited three books: Vulnerable Witness: The Politics of Grief in the Field [University of California Press, 2018, co-edited with Patricia J. Lopez]; Critical Animal Geographies: Politics, Intersections and Hierarchies in a Multispecies World [Routledge, 2015, co-edited with Rosemary-Claire Collard]; and Economies of Death: Economic Logics of Killable Life and Grievable Death [Routledge, 2015, co-edited with Patricia J. Lopez]. Gillespie was an Animal Studies Postdoctoral Fellow at Wesleyan University and has taught various courses at the University of Washington. She has volunteered with Freedom Education Project Puget Sound (a Puget Sound, WA-based prison education organization), Books to Prisoners (a Seattle organization that receives and fills book requests from prisoners throughout the United States), Food Empowerment Project (a food justice organization in Cotati, CA), and Pigs Peace Sanctuary (a sanctuary for pigs in Stanwood, WA).